I recently received a Kaizen Ultralight tenkara pack from Chris Zimmer of Zimmerbuilt. And like all of the tenkara items that I have from Zimmerbuilt, I know I'm going to like the Kaizen pack a lot. Here is what Chris says about the Kaizen: "The Kaizen Ultralight Pack is a small light weight pack designed to carry enough gear for a day out on the water. The pack weighs in at 2.3oz and is made of Xpac VX21 with a front pocket made of Dyneema X. The pack features two internal pockets, a clip hook, as well as two external side stretch mesh pockets. The Kaizen pack is designed to be carried over your shoulder, making it easy to access fly boxes/gear in the pack. While fishing the pack can be swung to your back and be completely out of your way. The pack measures 6" wide by 4" tall and is 2.5" deep. Pack design input and testing by Adam Trahan of Tenkara-fisher.com"
The Kaizen is designed to be worn at your side, like a mini purse or satchel, not on your chest like a chest pack (although it can be worn that way). It comes with a long, adjustable strap that allows you to adjust the height of the pack at your side. It's a simple but effective design. The main compartment is large enough to carry a modestly sized fly box. I have my tenkara flies in a small C&F Design systems box and it fits perfectly inside, without being too tight. Access into the main compartment is through an easy to open waterproof zipper. This is important since carrying your gear on your side does increase its change of exposure to water if you happen to wade into a deep hole expectedly. The pack is not completely water proof, but it will keep out the vast majority of the water during a quick dunking. Inside the main compartment are two zip open pockets, one on each side. These are perfect for extra lines, tippet, or what ever you have a need to carry. I can carry numerous lines in these using my spool card lines holders. On the outside is a front pocket perfect for holding a spool of tippet, some floatant (like Dry Magic) and/or a folded Wonder cloth. There are also two stretch mesh pockets at each end of the pack. They are small but functional. The Dry Magic could go in one of these. As Chris states in his product description, the Kaizen pack was designed with input from Adam Trahan of Tenkara-fisher.com. This is a testament that Chris listens to his customers. In fact, most of the products that he highlights on his website are custom made for customers, to their specifications. I like the Kaizen Ultralight pack. It gives tenkara fishers another excellent option for carrying just the right amount of stuff to the stream without getting carried away (so to speak). Want one? You can but one here. 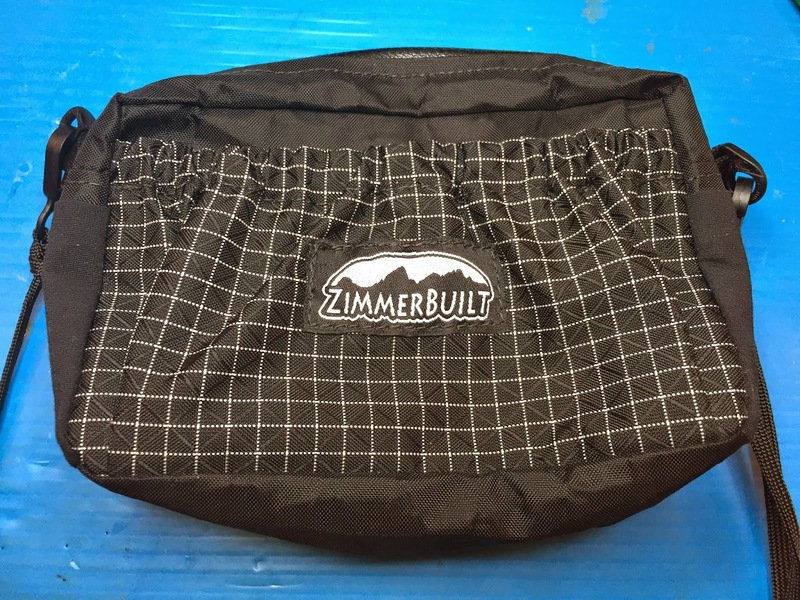 Tom, what is your recommendations for Zimmerbuilt gear in regards to chest packs, is there one you tend to use more?